Tabby's Tunes is run by a mum of two. Tabby is a singer, pianist and guitarist who studied at The Purcell School of Music and went on to study and graduate from The Royal College of Music. Since graduating from The Royal College in 1999, Tabby has sung as a lyric soprano in various recitals, private and corporate events. Only recently has she moved into the world of Jazz and Blues and has performed at a London Jazz Venue. She has also taught singing and the piano to adults and children since 2003. Tabby loves music and loves to share the joy and fun that music brings. So whether it's singing Puccini, teaching little ones to play the piano and to sing, or singing at Tabby's Tunes - Having fun is what it's all about! Tabby started Tabby's Tunes in 2007 when her son was 6 months old. 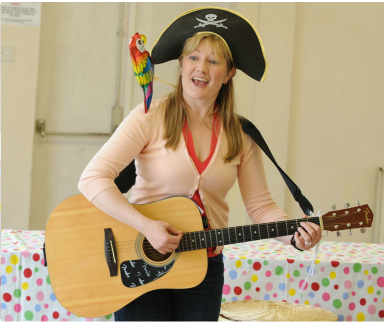 All her NCT, Antenatal and Postnatal friends were eager for Tabby to start her own music class for them, so there and then in the comfort of the garden over a cup of tea and biscuits, Tabby's Tunes was born. Juggling bringing up the children whilst running the classes, means that gradually the classes are multiplying as and when Tabby can do them. She loves running the classes and seeing the joy and enthusiasm from all the little ones, parents and carers who come each week. Tabby is also CRB checked. We hope you come and join us for some musical fun!